We now use the latest in tree stump removal technology with our portable grinder, so that we can now access previously inaccessible locations in Brisbane North & Southside… With our new equipment we have been able to specialise in awkward access and removal. 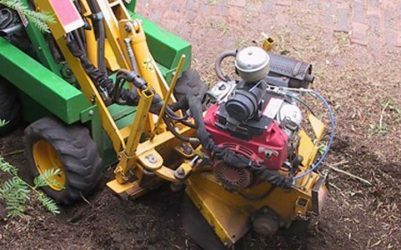 All Sites Stump Grinding Brisbane is one of the few specialists in the local area that can handle awkward access jobs as well as jobs that require larger machinery. There is nowhere we can’t get to with a portable tree root grinder in our hands. Difficult access can always be solved. 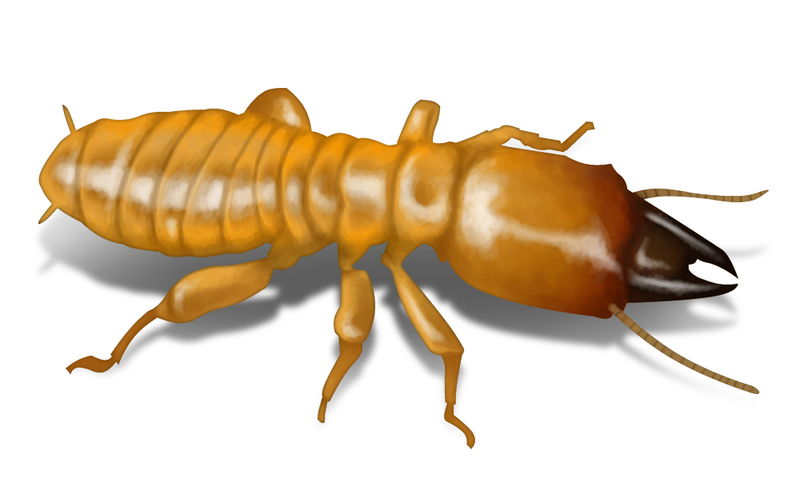 Trees are normally taken down and the roots will remain causing problems and attracting termites. By grinding down the roots you can also avoid regrowth of the tree or shrub. We usually grind down below the surface to a depth that is required by the client or the nature of the works. 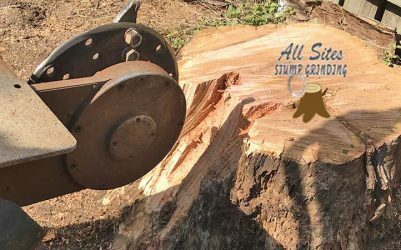 All-Sites Stump Grinding is a professional owner-operator business dedicated to providing superior customer service with 10 years experience we do the job right. We have a compact lightweight grinder that will fit through all gates which means we can get to and remove all old tree trunks. We cover the whole of the Brisbane and Ipswich area. There is nowhere we can’t cut or grind. Difficult access? “No problem”. 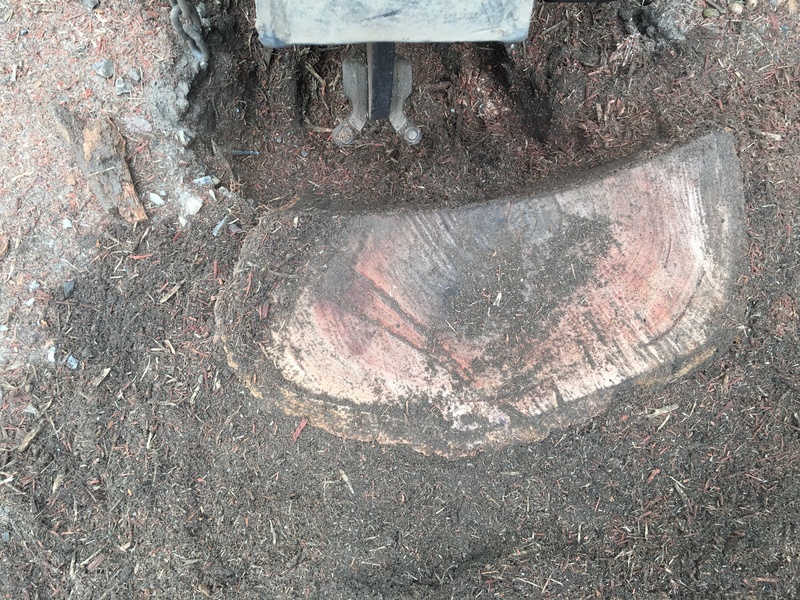 Stump grinding… We are fully insured for your peace of mind. With 10 years grinding experience behind us, you are guaranteed a professional service. All-Sites Stump grinding is proud to be sporting a brand new look website. In it we showcase our services and give you an insight into the work we perform on a daily basis, along with the quality of that work. 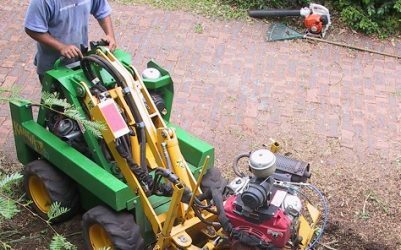 We hope that you will find it informative and we look forward to being able to provide you with a solution to your Brisbane stump grinding or tree clearance issues in the near future. Do you want to create more space in your yard? Have you just had a tree cut down and you’re looking at an obstructive, potentially dangerous and/or damaging tree trunks? Even if the stump is low to the ground – if the tree is still alive new shoots will continually grow out of the trunk and the roots. And if the trunk is dead, it makes a nice home for white ants. Is it worth the risk? All-Sites Stumpgrinding’s director and operator, Paul Penhall, has ten years experience and has the latest technology which makes us one of the only specialists in the Brisbane and Ipswich areas that can handle awkward access. Any large trunks are removed with the bigger grinder, which does need 900mm wide access. The trunk and roots are removed by literally grinding them out – so what is left is mulch you can use to fill the hole left by the old trunk or spread the mulch elsewhere in your garden. 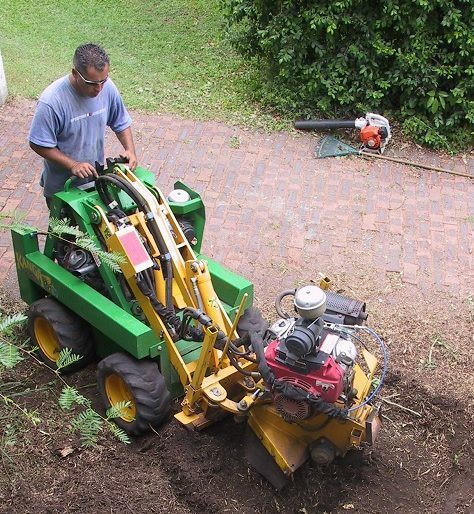 What we provide is a fast, reliable, safe and friendly stump removal service. We offer free quotes, services on the same day if possible and are available on the weekends. So don’t consider costly backhoes or excavators – stump grinding is the no-fuss, no-mess solution. 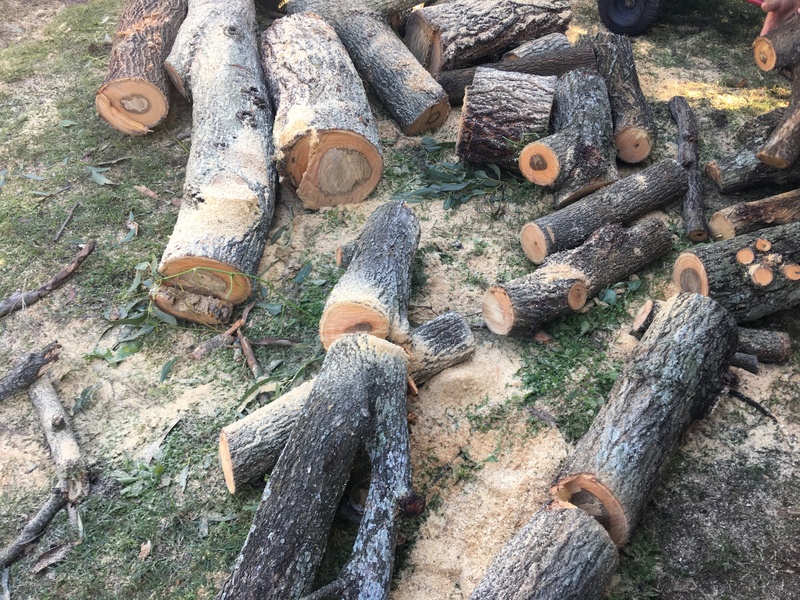 We will provide estimates over the phone, but we prefer to officially quote once we’ve sighted your stump(s) and confirmed how deep and/or extensive the trunk and roots are. Minimum price is $110 and if, for example, you have a large amount of average-sized palm stumps, then each stump could cost as little as $30. Hardwoods need to be quoted separately, and remember, the more tree stump removals you have, the cheaper it gets! Have you just bought property that has large trees? Are your existing trees starting to get too big? Are you worried about storms and falling branches that could damage vehicles or your house? Are your trees interfering with power lines? Are branches overhanging your roof, causing damage to and clogging gutters? Are tree roots and trunks in the way of home improvements, a new fence or shed for instance? Are the tree roots getting into underground plumbing and sewage pipes? Is your tree a pest, like a Chinese elm, or do you just need a canopy trimming? There is nowhere we can’t cut or grind . Difficult access? “No problem”. Trees are normally taken down limb by limb, from top to bottom. There are many reasons why property owners consider lopping trees. Our experienced climbers will ensure that your property and tree(s) are in safe hands. They are fully insured and have many years of experience between them. If you, have any of these problems, call us today on 0433 028 124. We can cut the tree and remove the trunk on the same day. Real Reviews From Our Happy Stump Grinding Customers. Friendly person, good job, prompt to arrive at agreed time. Did a great job. Friendly and on time. Pleasure to deal with. I rang Paul on the weekend and true to his word turned up bang on time Monday. The job had grown by two small stumps and he kept to his original price. Job was very quick and professional. I wouldn't hesitate in recommending Paul to anyone. Very easy to deal with. Paul is a very pleasant person to deal with. Easy to communicate with and does a great job with a quality finish for a good price. Paul was very prompt in replying to my request to do a quote for some stump grinding. His quote was very good, I accepted and he did the job immediately. He did an awesome job and tidied up afterwards. What I appreciated was the fact he has a smaller grinding machine so the limited side access to my back yard in Forest Lake was not a problem. I have no hesitation in recommending Paul from All Sites Stump Grinding for your next stump grinding job! Thanks Paul. Much appreciated! Top quality service at a great price. Cleaned up after the job. Will use again. Very easy and professional to deal with from the get go! 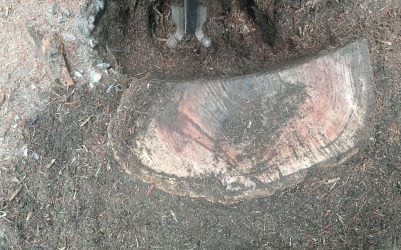 Recommend Kiwi stump grinding services to anyone needing to clean up after tree lopping has been done. 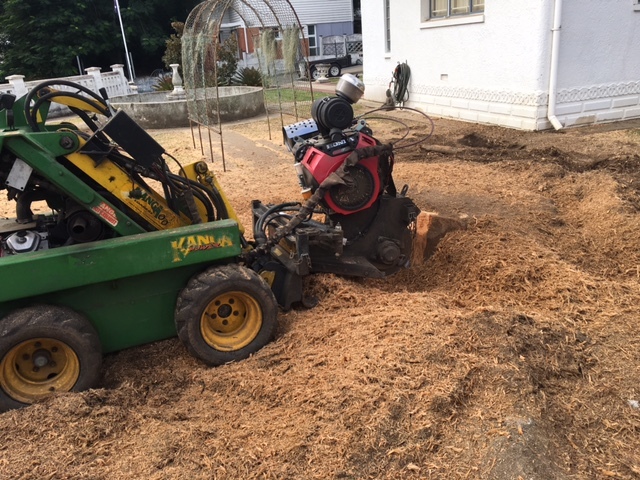 Kiwi stump grinding Brisbane came in and removed all of the stumps prior to us starting a large commercial landscaping job in Brisbane city.We highly recommend Kiwi Stump Grinding and will be using him in the future!